For Some of the people I had to get presents for, for Christmas, I decided to make some birthday cards. 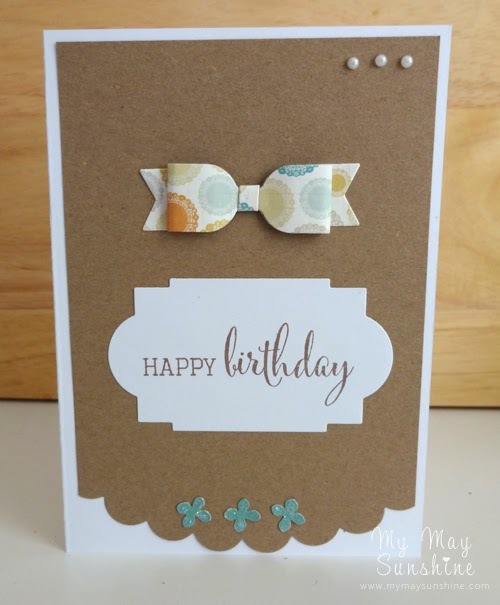 I had bought the My Favorite Things bow die and was loving it, so decided to make some cards with it. 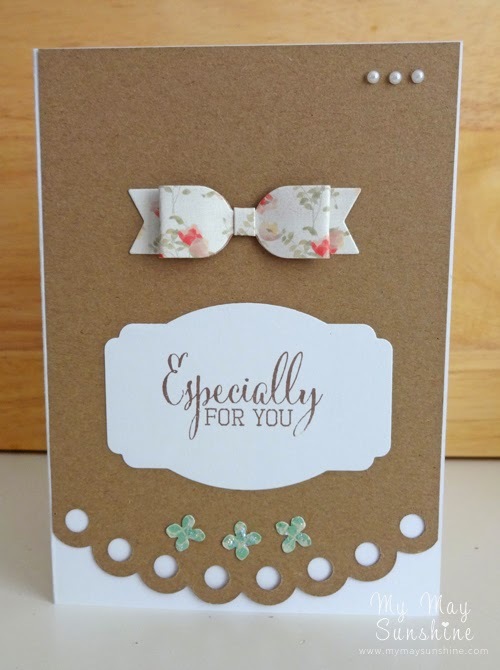 I made some cards with bows and some with butterflies as the main focal point. For the sentiment, I used the Clearly Besotted Fabulous Fuchsias stamp set and used the sentiments from that. I stamped them on a label from Clearly Besotted Lovely Labels. At the bottom of the card I decided to use the Clearly Besotted Decorative Edges to break up the cards a bit. 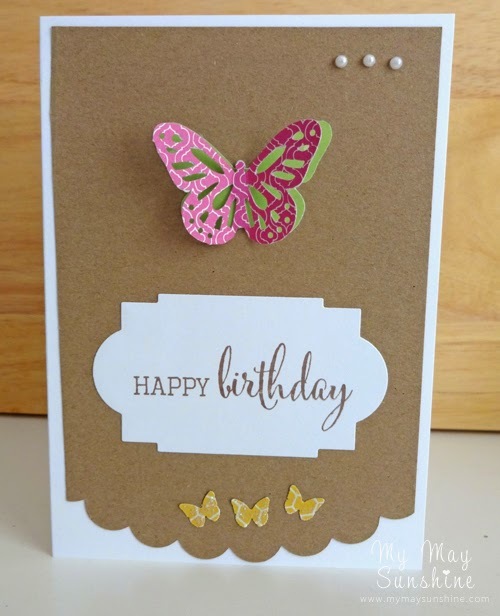 As the cards were looking a bit plain, I added some more butterflies and flowers to the bottom of the card and then some pearls to the top. 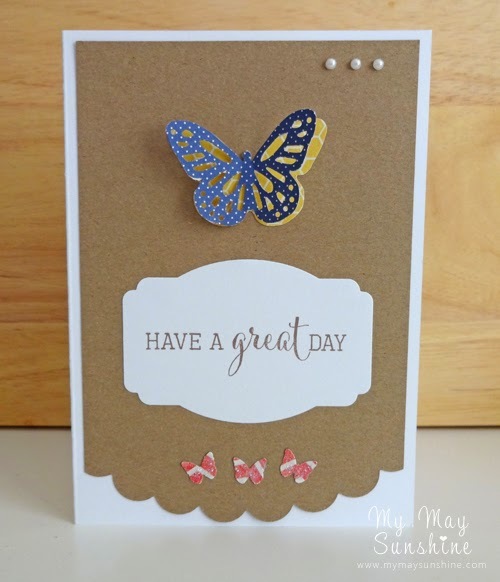 For the butterflies, I stuck one butterfly down to the card and then stuck another one on top in a different colour and made it so it would be 3D. Some of the cards I added some patterned paper under the decorative edge part to add some more colour but some I left plain. Also some of the cards I made the kraft card smaller so that there would be a border of white around the outside but some of the cards I made without any border. Paper – My Minds Eye Kate & co, In Bloom and Follow Your Heart and Crate Paper Flea Market | Stamps – Clearly Besotted Fabulous Fuchsias | Bow die – My Favorite Things Beautiful Bows | Butterflies – Martha Stewart punches | Flowers – Martha Stewart 3 in 1 hydrangea punch | Labels – Clearly Besotted lovely Labels | Scallop edges – Clearly Besotted Decorative Edges Shallow | Pearls – Hobbycraft. 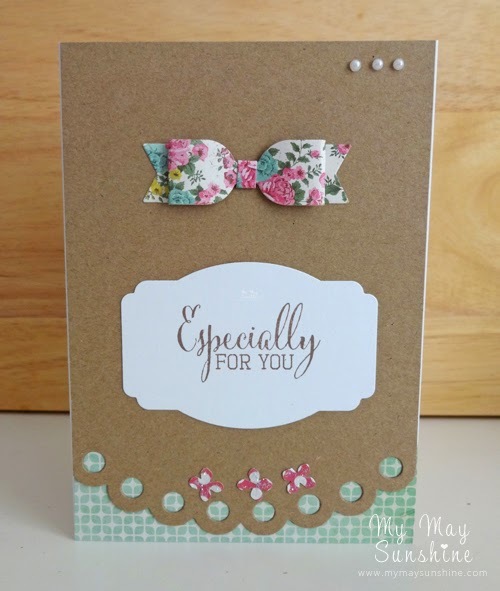 These cards are quite simple and not too fussy but I love the bows!